DESKO´s IDenty chrom is the latest member of the chrom family (see also NEPTUN chrom keyboard) and your perfect support for a smooth and trouble-free check-in process. 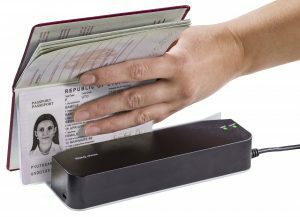 The device captures data from ID documents such as passports, ID cards or visas. In addition it reads magnetic stripe and chip cards. The IDenty chrom is water and dust resistant according to IP54 regulations. It withstands water spillages without any functional restrictions. 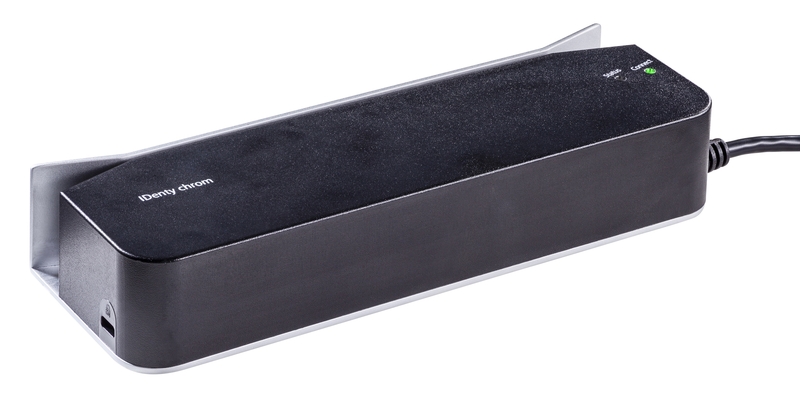 Due to its small and compact design, the IDenty chrom fits even the narrowest workstation. In addition to the standard version, the flexible IDenty chrom mobile is available equipped with Bluetooth® technology and battery pack. This combination allows for an independent operation and supports you in providing your customers an exclusive and convenient service. *The Bluetooth® word mark and logos are registered trademarks owned by Bluetooth SIG, Inc. and any use of such marks by DESKO GmbH is under license. Other trademarks and trade names are those of their respective owners.